Named for Edward Alexander Bouchet, the first African American doctoral recipient in the United States, the Edward Alexander Bouchet Graduate Honor Society (Bouchet Society) recognizes outstanding scholarly achievement and promotes diversity and excellence in doctoral education and the professoriate. The Bouchet Society was inaugurated on Thursday, September 15, 2005 with a simulcast ceremony held at Yale University and Howard University. As the co-founding chapters, Yale University and Howard University seek to recognize and continue Dr. Bouchet’s pioneering contributions to doctoral education. The Bouchet Society seeks to develop a network of preeminent scholars who exemplify academic and personal excellence, foster environments of support, and serve as examples of scholarship, leadership, character, service, and advocacy for students who have been traditionally underrepresented in the academy. In the spirit of Bouchet’s commitment to these pursuits both within and without the academic realm, inductees into the honor society bearing his name should also exhibit these qualities. 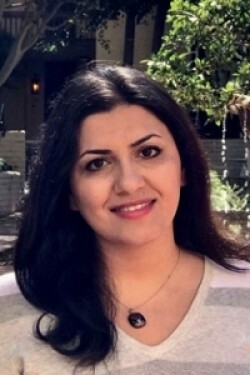 Mojegan Azadi is a PhD candidate in Astronomy at the Center for Astrophysics and Space Sciences in University of California, San Diego. She is interested in studying the physics and evolution of supermassive black holes living at the center of galaxies. Her dissertation focuses on multi-wavelength investigation of supermassive black holes and the galaxies in which they live. Mojegan uses observational datasets from the Keck telescope in Hawaii and the Magellan telescope in Chile as well as data from various space-based telescopes to identify supermassive black holes. In her research she addresses fundamental questions such as what physical mechanisms trigger supermassive black holes activity in some galaxies, what types of galaxies host active supermassive black holes and what impact supermassive black holes have on their host galaxies. Mojegan is also a co-leader of the Graduate Women in Physics group, an organization committed to help graduate students navigate academic and professional challenges, and prepare for successful academic careers. Her contributions for various outreach and advocacy efforts have had positive impact on undergraduate and graduate women in physics at UCSD.